The Faraway Tree House is a magical little gem nestled amongst the trees of this magnificent English country garden in the heart of beautiful Suffolk. The large external deck wraps around the tree house, maximising the sunlight and breath-taking views over the pond, moat and surrounding garden, providing a truly spectacular space to relax, unwind and enjoy a glass of wine! 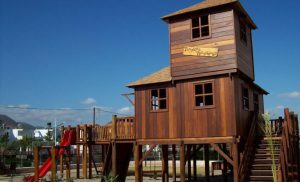 The tree house has been expertly finished with premium grade Cedar cladding and the traditional thatched roof and rustic Oak ‘stag horn’ branches ensure that this enchanting hideaway is a beautiful, eye-catching addition to the garden. The entrance to the Faraway Tree House is via a rough-hewn spiral staircase, with a rustic timber branch hand rail, that leads you onto the expansive deck. The double doors allow plenty of light to stream into the quaint interior, complete with kitchenette and comfortable reading nook, perfect for curling up with a good book or relaxing whilst taking in the wonderful sights and sounds of nature that surround you. The rustic features, and personal touches really bring this enchanting tree house to life! The tree house has been brought to life by all the personal touches that not only reflect the owner’s personality, but also make this magical Faraway Tree House something truly special, enticing all who see it to come on in and enjoy the wonderful peace and tranquillity it has to offer! 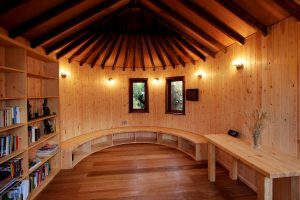 The Treehouse Study provides the client (a retired scholar) with a quite study from which to contemplate life and continue with his academic work. The cosy room features Oak floors, Cedar lining as well as underfloor heating and bespoke built-in furniture. Sensatori are a new generation of stylish hotels from Thomson Holidays. The first hotel in this collection is Sensatori Crete, which opened its doors in May 2008. 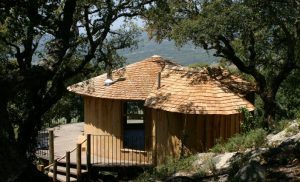 Tarifa ecolodge consists of a collection of three eco-lodges located in the hills of Andalucia, on the Spanish Costa de la Luz. Each lodge enjoys incredible views of Africa across the Straits of Gibraltar and is highly insulated to withstand the harsh environment.